The Blu-ray edition of the 'Doctor Who' spinoff is over fifty percent off today only at Amazon! 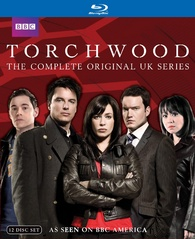 The online retailer has dropped the price of 'Torchwood: The Complete Original UK Series' to only $63.99 (51% off suggested list price). This set includes 'Season One,' 'Season Two,' and 'Torchwood: Children Of Earth' on 12 discs with over 10 hours of bonus supplements all housed in new digi-style packaging. Click here to save big bucks on this great set today!